Our flight arrived at the airport a bit past midnight. We managed get out of the arrival gate by 1AM, and nothing was open, except for a few foreign exchange places. We quickly changed our money into Vietnamese Dong. Now due to hyperinflation in the country some years ago, the denomination asides from taking out the decimal places, had extra zeros. Which was quite confusing if you’re encountering this kind of money for the first time personally. Expect having bills as high as 500,000. But despite the seemingly millionaire-ish feeling, don’t take it at face value as most commodities would be priced relative to those. But don’t worry, everything in Vietnam is cheap, if not cheaper than the Philippines. You can get away with as much as P 10,000.00 equivalent of pocket money living like a king for a week more or less. Now that last item was quite the hair raiser. It was dark in the car and the barker dude (for the lack of a better term), asked us to fan out the money we had and he would pick out the bill to pay for the toll. At this point we started to semi panic in the car, but the guy did just get one bill and paid for it. We spent the rest of the ride, thinking of desperate measures just in case we got robbed or something. The mere fact I’m writing this meant we did make it out in one piece. Moral of the story (for this leg): try to get an earlier flight if you can. We didn’t do much of our homework this time around and just winged it the moment we got into town. We stayed in the better part of the Old Quarter near Hoam Kiem Lake, so we’re assured of walking distance to some attractions at least. Alot this part of the city reminds you of Binondo and Divisoria all rolled in one. Peppered between high end establishments are sidewalk pho eateries. You really sit on the sidewalk and enjoy your bowl of Pho. Now the foodie in you would certainly enjoy the numerous cafes and Pho bowls (ranging from sit down places to sidewalk vendors). The walk around town would help you burn the calories for the next meal. 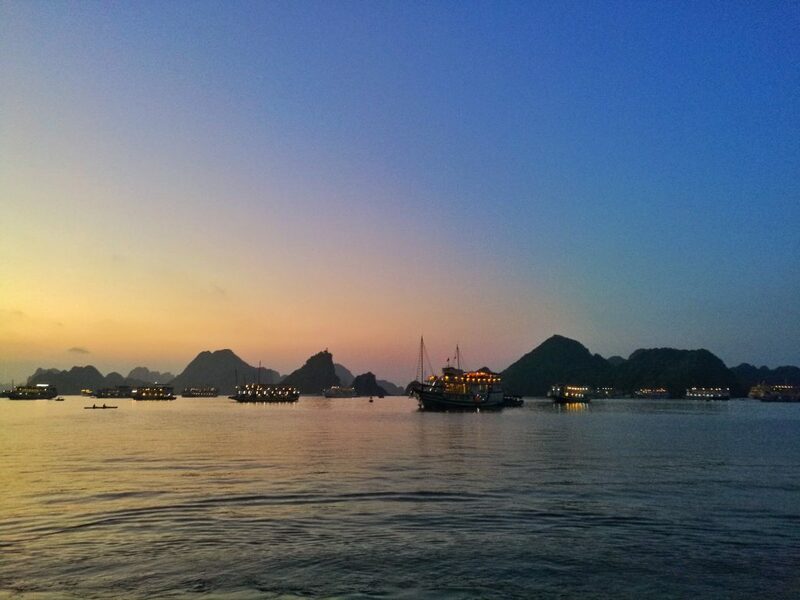 Now, picking the right tour operator who would bring you around Halong Bay is a crucial factor. 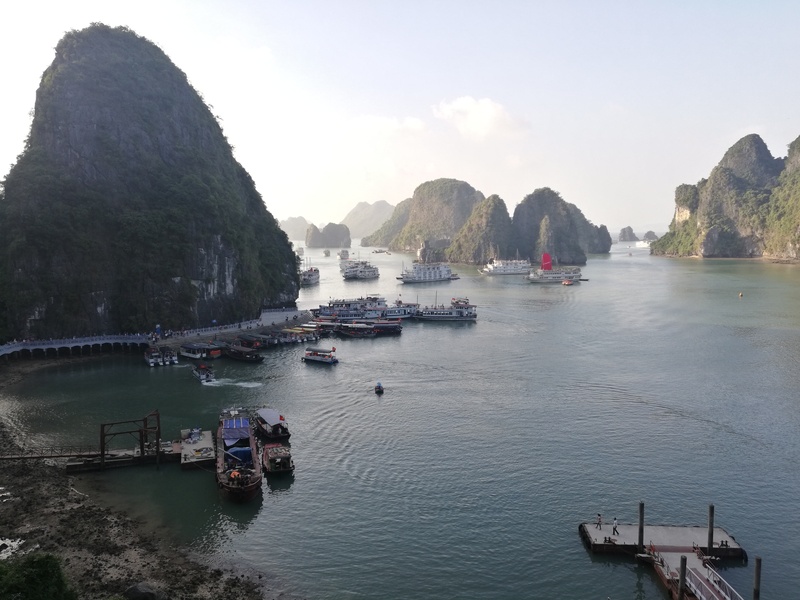 Since we arrived in Hanoi with no definite plans, we were pretty much up for anything. 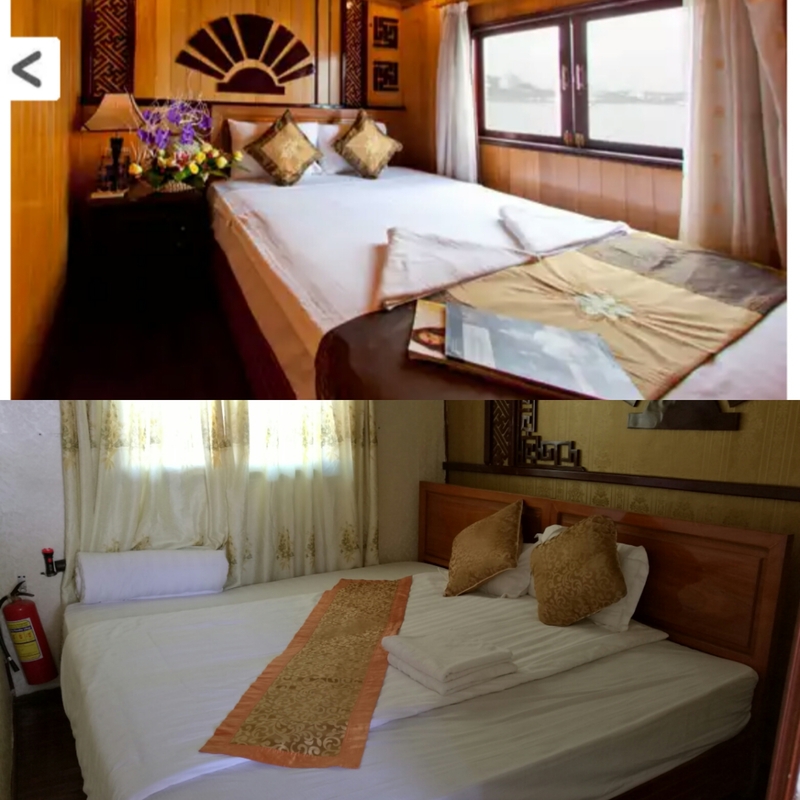 So going around town on Day 1, we stumbled upon a tour operator in some small hotel. There is something that subliminally associates small dingy alleyways to shady businesses, so the stereotype stuck as our first impression. 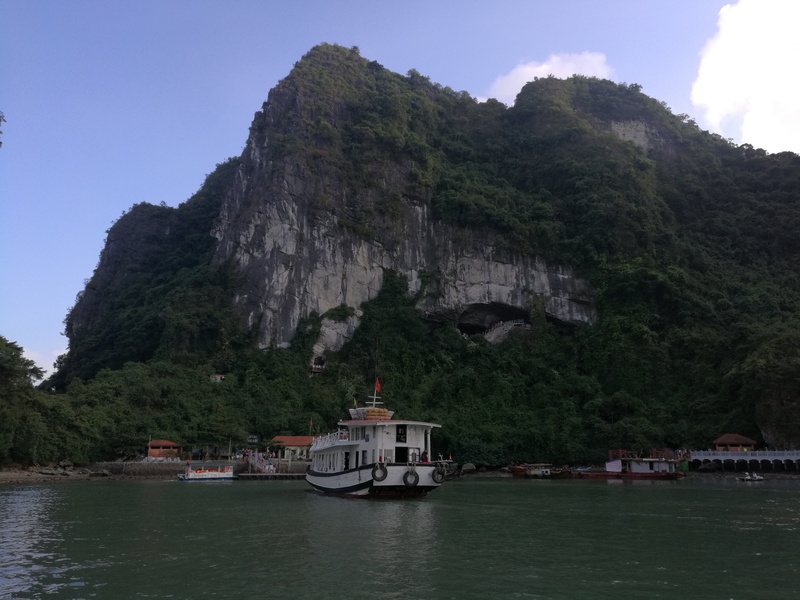 We were at that YOLO moment, so we decided to take a last-minute cruise to Halong Bay. Word of advice (and/or caution), don’t get enamored by the beauty of the brochure. It borderlines false advertising. We would find that one out the hard way later. Anyhow, the wife and I decided since we don’t really know where else to go in Hanoi, we jumped on any opportunity at any open cabin. We left the tour office that afternoon excited for our upcoming cruise all thanks to that brochure. 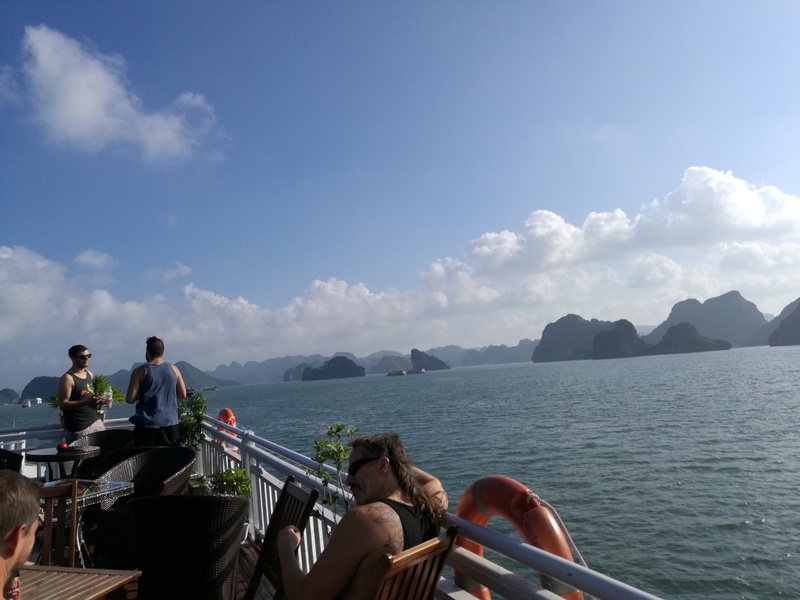 We left for Halong Bay on time the following morning. The trip it pretty much uneventful except for a brief bathroom break in some tourist center halfway. They were selling textiles, gemstones and snacks in this nondescript building. The place reminded me of those old (but well kept malls) of 80s yore. We got into the port area by lunch time. After passing by several shuttered buildings and half-empty shopping arcades, we were greeted with an armada of cruise ships peppered about this U-shaped port / cove. My thoughts of this romantic getaway was already put into heavy doubt upon seeing the movement of humanity coming on and off the transport boats. Our tour guide quickly accosted us off the bus and endorsed logistics to another colleague of his, who never bothered looking at the guest list. “I cannot remember how you guys look like, so just remember how I look like!” he blurted out in broken English. 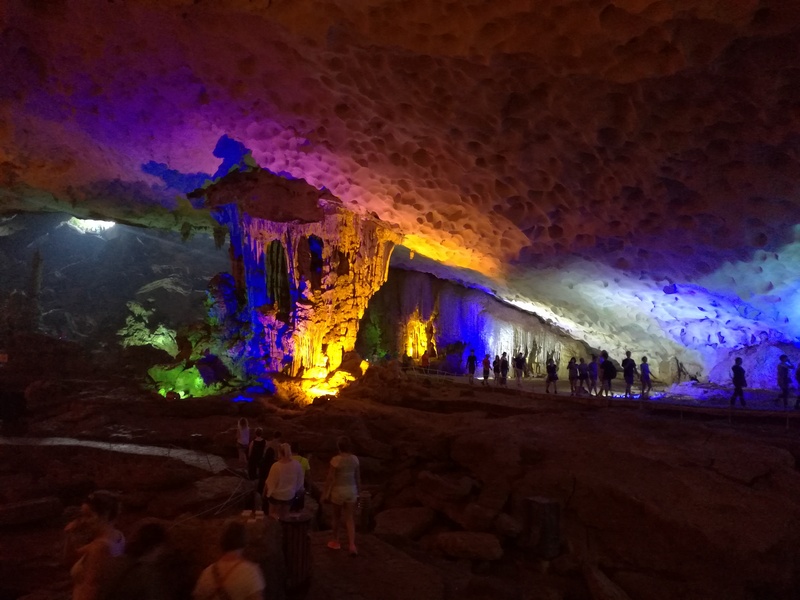 After checking in the boat, we cruised to Sung Sot Cave. 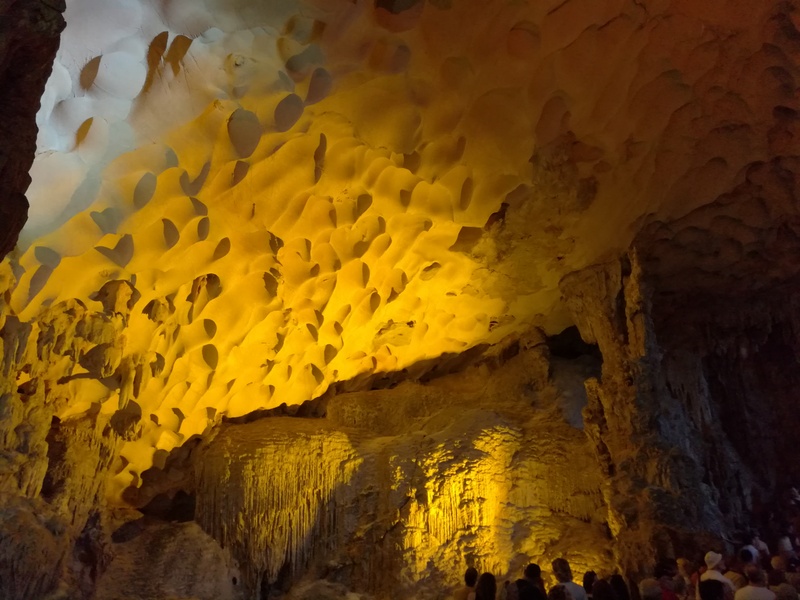 We were crammed with the rest of the other tourists coming up the cave. After the sardines of an entrance, the attraction proved to be quite enjoyable to say the least. After that was a 30-minute kayaking ride around the some of the coves. That was fun. There was also a cultural show in the evening, but we didn’t bother leaving our cabin for that anymore. That night it was hard getting some sleep since our cabin was right beside the engine room. The shower’s handle didn’t work at first, and the door’s lock was already too old.. it didn’t lock at all! I was already considering jamming my luggage against the door. Good thing one of the crew managed to make both things work for us after calling for our guide / translator. Before we left the following morning, I just had to take a shot of the “made up” room. It wasn’t even a mile close to the one they had on the website. We had that notion that this could be like a romantic getaway to sit and chill on the boat. Much to our surprise (and dismay), it was one tourist trap after another. I guess this is what you get from joining the bandwagon. Any hope of relaxing on the boat was out of the question. If you wanted some peace and quiet, you had to opt out of the side trips. We checked out of our cabins in the morning, and made it back to shore around lunch time. The journey back to the city was quite tiring and uneventful. For some slight side adventure, due to the traffic and supposed road closures (which hasn’t happened at the time), we were dropped off several blocks from our original hotel. We didn’t mind walking, though one would expect to be brought up in front of the hotel at least. Every weekend, the main circular road of Hoan Kiem Lake (and some adjacent roads) are closed to vehicular traffic. The general public would fill up the streets until late night, giving you a glimpse of contemporary Hanoi culture. Bands would play in the corner, and kids would ride these remote-controlled cars. Prenup shoots were at every corner. It felt like Luneta, except it had a large lake and it was Vietnamese. This was the best part of the trip for me: enjoying and soaking up the local scene. Our Hanoi trip did end in a good note that day. Here’s my full gallery below the rest of my Hanoi shots.